Shoots cannons. Also takes flight and circles above, landing in a plume of smoke. This pet is a free gift for purchasing the Starcraft II Collector's Edition. This edition will be sold in stores (in limited quantity) and it will also be found on auction websites the week of July 26, 2010. This pet features a unique tag of <The Destroyer>. From now till the 5th of July, 2018 Blizzard is having a sale on it's Starcraft II Campaign collection and if you get the Digital Deluze edition, you get the Mini-Thor, the Baneling, and the Archon pets. I was curious if it included Mini Thor seeing as I was missing him. Contacted support, who was extremly helpful, and they confirmed it, and because I already had the standard Starcraft II and the collector's HotS they said I could contact them later and they would free my old licenses up to gift to a friend. Glad they give us a chance to nab pets we missed. Hopefully they will do the same for D3 collector and Vanilla collector, I missed them aswell and can't afford to pay $3000 on ebay. It's worth mentioning that if you have already prepurchased the ce of Legacy of the Void that they will only charge you an additional $40. Mini Thor is back to being available, along with the Baneling pet, and the soon-to-be-released new mini-Archon pet if you buy StarCraft II: The Complete Collection Digital Deluxe for $99.00. Plus you get a game with 2 expansions... that... you can play... if you do... that type of thing. This was one of the first pets I leveled and its awesome. My goto mechanical. I love this pet, he's in as many battles as I can get him into. Sticky Bomb is missable/dodgeable though :(... Just time your Blocks just right. When the bomb drops, it happens at the end of that particular round. So for example, the moth will attack and then curl into a cocoon, if your pet goes first, then the cocoon will break once the Thor attacks, exposing your pet to the bomb. If your pet strikes last, then it'll be in the cocoon state for the bomb. It's possible that burrow and fly high have similar limitations. But it's all about timing. For those who have this little bugger, you also have a ridiculously strong battle attack. His Sticky Bomb appears to be unblockable (Murkimus got squashed), unavoidable (high-flying and back line doesn't help, probably not burrow or dodge either.) and hits really hard. Does it matter if you have a PC and get the Mac CE of SCII for the pet? Will it work anyway? I am thinking yes since all you need to do is put in the code in your accnt to confirm you have it but I am wondering if anyone knows for sure. If you're still looking for this... there are copies of the SC2 Collector's Edition out there at reasonable prices. Stopped by the game section of my local Walmart looking for something completely different and spotted it tucked away on the bottom shelf. I'd imagine other similar stores that carry games, but do not focus on them, probably have copies lying around if you're lucky enough to find them. Is it odd that I purchased the special edition version of StarCraft 2 exclusively for this pet? I don't regret it - my bank account does. Notes section says "This pet features a tag of <The Destroyer> rather than <Name's Companion>." Also when Mini Thor flies around the name and title tags don't move with him. They stay fixed to the spot where he takes off and lands at. For the amount of money spent on TCG pet that only 1 (one) character can have, the cost of the SC is worth spending, since it is account bound. Very cool pet, minimum idle, looks great with a papa hummel cookie. This pet is Bound to the Starcraft 2 Serial Number (at least with the European Collector's Edition), so it's not possible to buy it on Ebay. You get it on the first login with one of your WoW-Characters, after you linked your SC2 Key with your Battle.net Account. There is No Extra Code within the Collector's Edition. 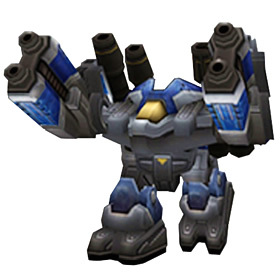 Powerful artillery of the Terran army. The Thor is always the first one in and the last one out!